Only 1% of people in this country own and control the wealth, while 99% struggle, suffer while being denied a share of the wealth and quality healthcare. 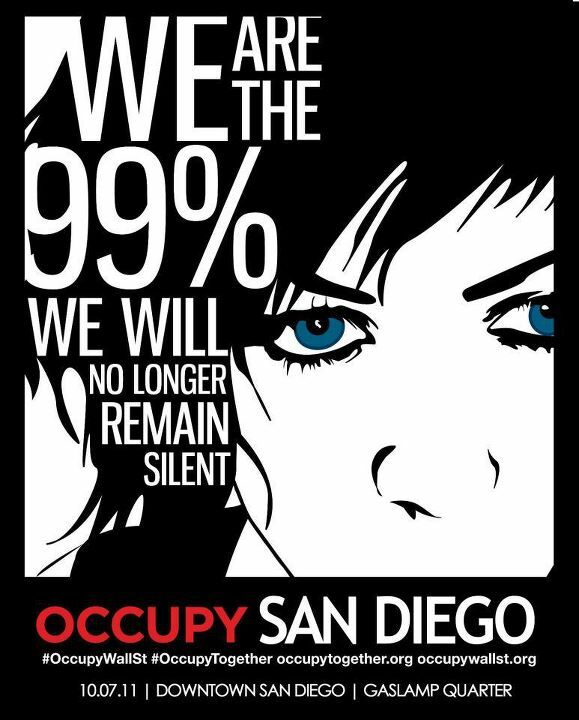 In solidarity with the occupation of and vigorous protest on Wall Street, we are people of the 99% are occupying and protesting in the Gas Lamp Quarter and downtown area of San Diego, from October 7th 2011 beginning 4:30 PM until indefinitely. Gas Lamp/downtown is in the same area of the financially corrupt San Diego County administration and financial hub. ALSO: Since San Diego is one of many hubs of military activity, we are exercising this opportunity and right to protest and demand an end to corporate financial backing of the present useless wars being perpetrated by our country, which is inundated with greed and aggression . We support the troops, who are really a part of the 99% of the American people, manipulated by Wall Street and the 1%. The plan is to actually camp out in the aforementioned areas until a list of our demands in solidarity of the Wall Street NYC occupation are met or sincerely heard and considered by representatives of the financial and county conglomerate of San Diego. We must be open for ideas, sharing and horizontal, equal leadership and representation. Click HERE for a map to the occupation area at San Diego Civic Center.